For me, senior year is a list of count downs: counting down to my eighteenth birthday, to college deadlines and shining most teasingly away, of course, counting down to graduation. In this current world of projects and deadlines, of feeling my toes creep towards the finish line, I can’t help but still feel sentimental towards a few things. Tonight, the Douglas Anderson Writing Department is hosting its annual Coffee House. It’s known for the unique collaboration opportunity between all arts areas and its determination to showcase original, student created work. It will be my last as an official member of the school. The beautiful thing about Coffee House is that not only does the show change every year, both in writing and style, but the way that you as a person experience it changes as well. My freshman and sophomore years were marked as a performer, not of my own pieces but of other people’s. I stood backstage, eavesdropping on masterful writers practicing, borrowed someone’s giant, sweaty gray shirt for a prop. I sat on the floor between acts, trying to remember lines that weren’t mine and watching local directors spit out instructions. I don’t remember anything from my Junior Coffee House, regrettably. I may have been on the bleachers, or at a table, sitting by one friend or another. The only thing I cared about was that the One-Girl-I-Hated wasn’t preforming, and that the pieces were taking me places I didn’t want –but needed- to go. This year, things have changed again. As a member of the Elan staff, I am behind the scenes. 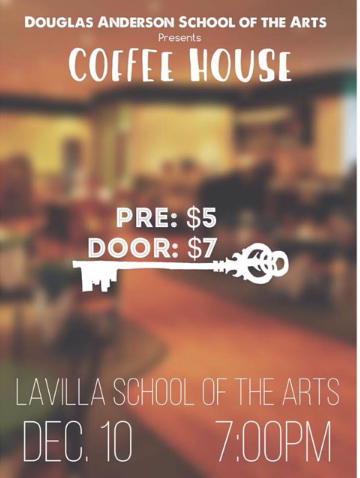 I have sold tickets, painted doors, been pushed past my comfort level again and again to help make Coffee House happen. The entire production feels more meaningful than ever before, not just because of the glare of senior nostalgia, but because I now appreciate every single aspect of the process. Some things stay the same, of course. There will be a theme (this year it is doors and keys), teachers will be thanked and coffee will be served. Due to the construction on our building, we’re going back to my middle school for the show. It feels a little like driving to an old neighborhood and vaguely recollecting checking that yellow mailbox, or drawing on that old porch. In a way, it hints at an even earlier tradition. Next year, if I’m in town, I see myself coming back to watch Coffee House happen. It’ll probably feel foreign, a little like trying on a t-shirt half a size too small, it also could feel like a crop top that suddenly fits just right. That’s the thing about tradition, it lets you hold on to the best feeling of things, and create new experiences as you go along. If you’re interested in attending, this event will be held at LaVilla School of the Arts from 7-9pm. Tickets will be 7 dollars.